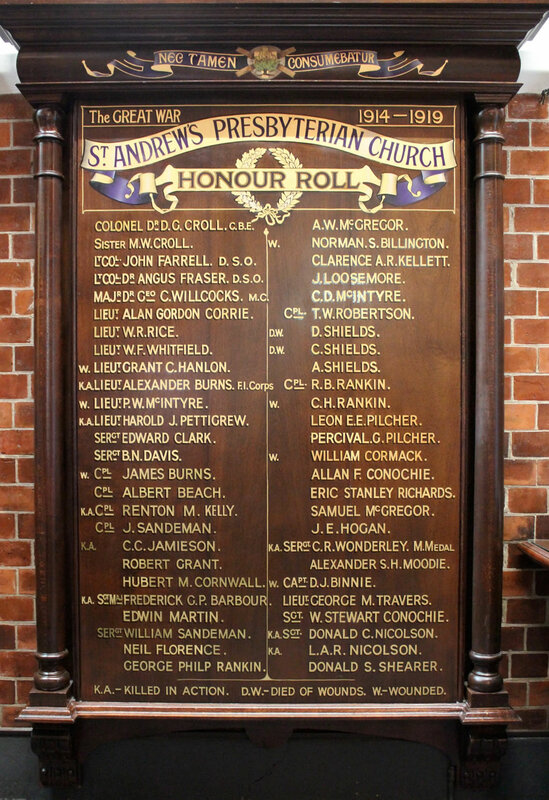 On the honour board in the Merrington Anzac Memorial Peace Chapel with the name of Colonel Dr D. G. Croll CBE on the top line are the names of three Rankin brothers. Their father was Robert Alexander Rankin (junior), a Brisbane City Council alderman and gentleman of independent means whose father Robert Alexander Rankin (senior) was a co-founder of the confectionery firm Rankin and Morrow. Their mother was Jessie née Philip. Alderman R. A. Rankin resigned his West Ward seat on the Brisbane City Council and the Fish Board in 1906 for health reasons. Their residence was at Woodlands, 137 North Quay where they raised their family of five sons and two daughters. They worshipped at Saint Andrew’s Presbyterian Church. After Mr Rankin’s death at the age of 60 years in 1908, Mrs Jessie Rankin lived at Merthyr Road, New Farm and later at Virginia Avenue, Hawthorne, Brisbane with her son, Ronald Benjamin Rankin. She died in 1935. George Philip Rankin was born in Brisbane on 31 January 1876, the second son of Robert and Jessie Rankin. He entered his occupation as a confectioner through an apprenticeship in his grandfather’s and father’s firm, then known as Rankin and Morrow. The confectionery and biscuits workshop was situated in George Street. In 1898 in Brisbane George married Margaret Lawson McLaren, daughter of Henry McLaren and Sarah née Pamplin. They had three sons, one of whom died in 1911 at the age of eight years. The family lived for short periods at Constance Street, Fortitude Valley and Turin Street, West End before settling at Elsham in Welsby Street New Farm. At the age of 40 years and 3 months, George Rankin enlisted in Brisbane on 12 May 1916 for service abroad in the AIF. He was given service number 5900 and allotted to 25th Battalion for brief training at Enoggera Camp before departure per HMAT1 Boonah from Brisbane on 21 October 1916 and arrival at Plymouth on 10 January 1917. Private G. P. Rankin trained at Rollestone (England) before proceeding overseas to France on 22 May. As the result of gunshot wounding to the thigh and gas poisoning while in action in late October, he was transferred by hospital ship St George for treatment at Southern General Hospital at Portsmouth, England and rejoined his unit in France on 18 January 1918. Private Rankin was transferred to 26 Battalion on 12 October 1918. After the Armistice on 11 November 1918 and periods of leave in England he experienced a long wait for return to Australia. He embarked from London per steamship Pakeha on 16 October 1919. Private Rankin was discharged in Brisbane on 10 January 1920. George Rankin resumed civilian life with his wife and family of two sons at their home in New Farm. He remained a confectioner for the rest of his working life. George Rankin’s second son died at the age of 31 years in 1932 and George Philip Rankin died on 5 June 1933 aged 57. His wife Margaret was 68 when she died in 1947.